Why are the presidential candidates employing such negative tactics and back biting and acting in such un-presidential ways? Donald Trump has been singled out, but similar accusations have been made against Ted Cruz and on the Democratic side both Bernie Sanders and Hillary Clinton (one of the most recent being the trading of insults about qualifications,"Bernie Sanders: Hillary Clinton is not 'qualified' to be president,"CNN, 4/7/16). The complaint amongst those who expect something more out of frontrunners in an election is that the candidates are not talking about the issues. 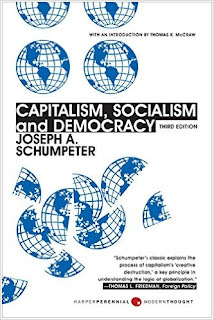 But actually the answer to the phenomenon of shining a negative spotlight on an opponent might be found in Austrian born economist Joseph Schumpeter’s theory of “creative destruction,” as described in his classic Capitalism, Socialism and Democracy. Schumpeter believed that capitalism required “the perennial gale of Creative Destruction.” In order to build you have to get rid of the dead wood. Planned obsolescence is, in essence, a form of institutionalized "creative destruction" in which a manufacturer knowingly creates something with a relatively short half-life. So if you're wondering why the candidates are belaboring the negative traits of their opponents, instead of concentrating on proposals for a new order, which will set things right, the answer may lie in the idea that progress can’t occur until the slate is wiped clean. When critics of Bernie Sanders say he has no real plan about what to do about the problems of the Middle East, the answer might be that new policies will only be implemented when the old ones are done away with and foreign policy becomes a tabula rasa.